Last time we saw that while alternative gravity models don’t agree with galactic stellar motion and gravitational lensing, the dark matter model does. While some of that dark matter is likely regular (baryonic) matter such as MACHOs (brown dwarfs, neutron stars, etc. ), such objects cannot make up the majority of dark matter in the universe. The cosmic microwave background indicates that only about 37% of the matter in the universe is the everyday baryonic matter that strongly interacts with light and makes up stuff like you and me. The other 63% must be something other than regular matter. Even though a fraction of the “dark mass” in galaxies is regular matter, we usually use the term dark matter to refer to the 63% labelled as “other”. The two main properties of dark matter are that it doesn’t interact strongly with light (so we don’t see its direct effect on light and regular matter) and it is some kind of matter (so it gravitationally attracts regular matter and dark matter alike). This is sometimes further divided into three types, known as cold, warm, and hot (basically categorized by the average speed of its particles). We know that hot dark matter exists in the form of neutrinos. They are called hot dark matter because they travel at nearly the speed of light (as opposed to warm and cold, with slower moving particles). There are three types of neutrinos, and we know they have mass because neutrinos can oscillate between the different types. If neutrinos were massless, then they would move at the speed of light and couldn’t change between types. I’ve written about this in detail before. What we don’t know is just how much mass they have. But we do have an idea of their maximum total mass. Moments after the big bang, the initial electrons, photons and neutrinos of the universe were produced. This means the number of neutrinos in the universe is related to the number of photons. We can calculate the photon number by observing the cosmic microwave background, so we have a good idea of the number of neutrinos in the universe. If the neutrinos had a larger mass their gravity would affect the distribution of galaxies. Galaxy surveys see no such effect, which means the total mass of all three neutrino types can be no more than 2 millionths the mass of an electron. When you take this upper limit and the number of neutrinos in the universe you find that they can only make up about 10% of the initial mass of the universe. This isn’t nearly enough to account for dark matter. But what if those neutrinos are all clumped around galaxies, couldn’t that (plus a bit of MACHOs and the like) account for the galactic observations? Since neutrinos are “hot”, they have lots of kinetic energy to escape the gravitational pull of galaxies, so neutrinos or any other hot dark matter wouldn’t clump much around galaxies. So even though neutrinos could be a part of dark matter, they can’t be a large part of it, and they wouldn’t clump around galaxies they way we observe. Because of this clumping behavior, most of the research effort focuses on cold dark matter. This is dark matter that isn’t moving at relativistic speeds. It would therefore tend to clump around areas that have a lot of regular matter, such as galaxies. The real question is what such cold dark matter actually is. One proposal has been a type of black hole known as a primordial black hole. Unlike regular black holes, which are formed from the collapse of large stars, primordial black holes would have formed in the earliest moments of the universe from the density fluctuations in the early universe. Assuming they formed before the creation of baryons, these would be non-baryonic, and wouldn’t be excluded by the cosmic microwave background observations. If primordial black holes exist and make up cold dark matter, then they should be so common that they would often pass in front of our line of sight for distant stars. This would cause the starlight to gravitationally deflect around the black hole, producing an effect known as microlensing. While we have observed some microlensing events, they aren’t very common. The number of events we observe is far lower than necessary for primordial black holes to be the bulk of dark matter. So cold dark matter must be something else, and this leads to the idea of Weakly Interacting Massive Particles (WIMPs). We aren’t entirely sure what WIMPs might be, but one popular idea comes from an idea in particle physics known as supersymmetry. 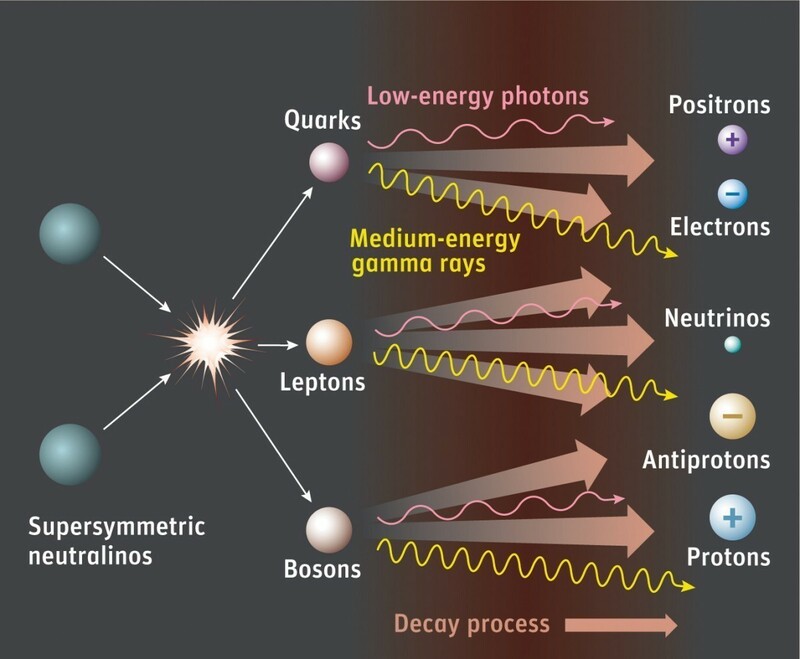 In particle physics there are two broad kinds of particles known as fermions (electrons, neutrinos, etc.) and bosons (photons, gluons, etc.). Supersymmetry is a model that helps to unify particle physics, and is at the heart of models such as string theory and loop quantum gravity. One of the consequences of supersymmetry is that every type particle has a supersymmetric partner of the other kind. So for every type of fermion, there is a supersymmetric type of boson, and vice versa. These superpartners would have much higher mass than regular particles, which is why we haven’t yet observed them in particle accelerators. The lightest of these particles is known as the neutralino. (According to the theory there are actually four neutralinos, and on of them is the lightest superparticle). Being the lightest, the neutralino is stable. It also wouldn’t have any charge, so it wouldn’t interact strongly with light. It is a perfect candidate for the WIMP. If WIMPs are neutralinos, then there are a couple of ways we could observe them. One is by direct detection. There are experiments currently running that are looking for events where a WIMP strikes the detector. Because of their mass they would be distinguishable from other interactions like gamma rays and neutrinos. There have been some interesting initial results, but nothing conclusive so far. Another way would be from collisions between neutralinos. Such collisions would create a cascade of particles, as seen in the figure above. There is a detector on the international space station that has been looking for these cascades. Again, there is some interesting data but nothing conclusive. Of course there is a problem with the neutralino. It is a hypothetical particle that appears out of supersymmetry, and while there are a lot of theoretical appeal to supersymmetry, there currently isn’t any evidence for it. In fact the most popular form of supersymmetry (one that draw upon an idea known as naturalness) is excluded by data from the large hadron collider. If supersymmetry exists, we should have seen some of the particles by now. That we haven’t is a huge conundrum. No supersymmetry means no neutralino. Because we actually know quite a lot. The hunt for dark matter is a detective story, and we’re closing in on the killer. All we have to do is collect the usual suspects and see what might be in store for the final act. But we’ll do that next time. It’s not a hoax, it just isn’t supported by solid evidence at the moment. That is a rather unpleasant tag to apply to a proper scientific theory, as if it was just plucked out of the air over a beer by a bunch of people with ulterior motives. I prefer to see it as one of the best things we have had so far that tries to take the Standard Model of particles a bit further. It may not be right, but a lot of things are not right while advancing thinking on a topic. You have a deeper insight into this, obviously. Or at least, you claim you do. So just cos we don’t know how hot is under neutrino levels, cold for us, boiling over there. Major question is “What is that under that starts that cyklus and merge energy at such small levels to become higher particles such as neutrinos ?” As you mantion in “Little Neutral One” cit:’Radioactive decay is where the atom of an unstable element can decay into another type of element, releasing energy in the process.’ Latter in text stand ‘In 1968 Bruno Pontecorvo proposed that neutrinos had a small mass. This proposal would change the standard model slightly, but leave the overall predictions largely unchanged.’ But if we want to go in details we can tell that everything with energy has some minimal mass. Again, we can’t tell how big it is cos we are too big. So if mass is relative to energy there is always some mass in particles. Now we can ask next “What mass represents in fact, for real ?” We call it ‘weight’, but weight is not just mass. Even smallest electron can be something as sub dimensional neutron binary or ternary system based on our binary star system but much larger, or in this case a lot smaller. I’m just appointing to plausible situation. It is strange, real strange, when we see this on big scale. So what is mass ? We explain it as physical property of some matter. When is mass, then is matter. Later on studies we learn how EM forces doing the job we see as any physical interaction on our levels. Huh, let’s stop !! Mass is repulsive/attractive force of energy !?? Wooooo. But how can that be ? Then, there is no mass ! Just energy. Energy is somehow coded as there was proposal in M theory, string one. I’m not sure what we need that mass for ?! Better thing is that we find out how this energy preserve it’s form over sub/supra dimensions. If we really live in matrix then we got all the answers around us, but the problem may be to accept it bare minded. Cit:’Since neutrinos are “hot”, they have lots of kinetic energy to escape the gravitational pull of galaxies…’, or they are lost all energy and then they can ‘fall in’ this dimension, or slip to upper one. We observe them by experiments via LHC and sort of. We spend a sum of energy in collision, how then can they have lot’s of kinetic ? They are particles at rest, spoiled, warned out or so. Dark matter don’t need to clump at some regular base. It can behave almost like our twin universe(where we have matter and galaxies) there it is, cos it follow similar pattern. Universe don’t have college or degree in some specialization. Universe is smart enough to give us golden ratio, Phy and things like that. He is master of arrangement. Mr. Fix It. So in short. If 1&3 is matter, we can say that one third up and one third under give almost one whole integral part where universe is possible. I think that primordial b.h.-reverse-dark matter-reverse-our b.h. is just one cycle of dark matter+dark energy surplus. Like baryons, when they can’t be here they are in rest state, when they pop out they decay if not couple like. Defective state. About WIMPs. I would like to call them 1&3 part of each fractal-foam state(not space/time as Einstein proposed) cos space and time is unified name for different measurements, OK we all read time world wide same way. Supersymmetry is maybe just a by-product of coded, as proposed M theory say, strings in foaming 1&3 interpolation states. LHC is not giving supersymmetry, rather super-echoing. It’s like our colleges. We are recycling recycled recycle. Neutrino will pop out or half decay cos he has to. Universe has no sense for jokes. So, what gravity is ? Gravity is material stress expression of space around us. Gravity is The World of Universe. The WMAP page from NASA says that 4.6/(24+4.6)=16% of the matter in the universe is made of atoms. Where does your 37% estimate come from? ..one third was about that we got step under, us and one step over. 16% is for now, and how much we can say. In some day it may be 20 or 30%. Thanks for correcting me. I m about the story not bare facts.